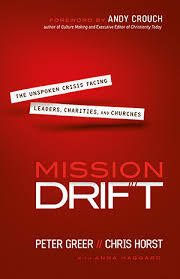 “Without careful attention, faith-based organizations will inevitably drift from their founding mission.” So write Peter Greer and Chris Horst in Mission Drift. The most obvious form of such drift is the outright secularization of the organization. But secularization doesn’t happen overnight. It is preceded by small compromises that, when put together, lead to fundamental changes in the organization. Mission True organizations believe the gospel is their most precious asset. They make hard decisions to protect and propel their mission. Mission True leaders assume they will face drift and build safeguards against it. Mission True organizations have clarity about their mission. Mission True board members understand their top priority. Mission True leaders set the cultural tone for the organization. Mission True organizations hire first and foremost for heart and character. They partner with donors who believe in their full mission. They track metrics reflective of their full mission. They understand the gospel demands excellence in their work. They are fanatics about rituals and practices. They boldly proclaim their core tenets to protect themselves from drift. And they recognize that the local church is the anchor to a thriving mission. Greer and Horst devote a chapter each to these principles, illustrating them with both positive examples of Mission True organizations and negative examples of organizations that have drifted from their founding mission. “Not all change is drift,” the authors acknowledge. Indeed, they argue, “remaining Mission True will demand you change to continue to fulfill your mission.” Thus, faith-based organizations need to “[d]ifferentiate means from mission.” The former change; the latter stays the same in a Mission True organization. I recommend this well-written, clearly argued book to the leaders of churches, denominations, and faith-based charities, both paid staff and volunteer board members. It will help them keep the gospel central to their organization’s reason for being, sharpen its missional focus, and help them keep it Mission True.